1. 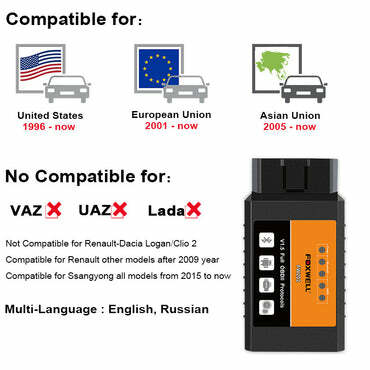 Full function OBD2 OBD Automotive Engine Scanner , read and clear errors. 2. It delivers SAS (Steering Angle Sensor) Calibration on more than 41 vehicle makes. 3. Compatible with both OBD AND OBDII cars, suvs, minivans, light-duty. 4. Identifies the vehicle you are testing rapidly and accurately on the basis of its VIN number. 5. Reads and clear codes and turns off ABS/Airbag warning indicator. 6. It shows live vehicle sensors data in text and graph format and allows you to focus on any suspicious or symptom-specific data. 7. You can view 2 parameter graphs simultaneously and merge them into one coordinate, so you can easily see how they affect each other, providing you with the most comprehensive and functional look at live data possible. 8. It allows you to use the scan tool temporarily activate or control ABS/Airbag system or component. with NT630 pro, the check of electronic components such as switches, sensors, relays actuators is made a simple task, saving your time and labor costs. 9. Multilingual menu options and code definitions for an international marketplace. 10. With internet access, you will always have the latest bug fixes, new vehicles, newly added parameters and functionality at your fingertips, and they are free for the first 18 months after your purchase. 11. Clearly arranged keypad, menu-driven operation, shortcuts and impressive 3.2" color display together make the series extremely easy to use. 12. It is constructed to resist impact and damage in the tough workshop environment, arubberized sleeve protects your investment. Foxwell NT630 Elite lets you identify the vehicle you are testing rapidly and accurately on the basis of its VIN number. It automatically retrieves the VIN code or you can enter it manually to identify the model you are working on. Foxwell NT630 Elite shows live vehicle sensors data in text and graph format and allows you to focus on any suspicious or symptom-specific data parameters. It's powerful graphing capability gives you the 'real picture' of what's going on in the vehicle. You can view 2 parameter graphs simultaneously and merge them into one coordinate, so you can easily see how they affect each other, providing you with the most comprehensive and functional look at liver data possible. 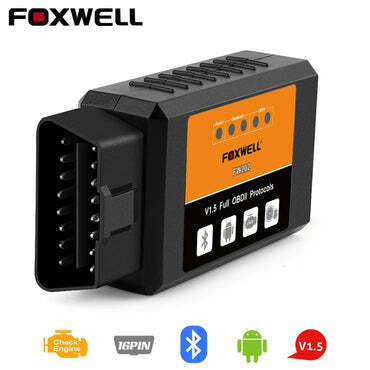 -Foxwell NT630 Elite can not only read your codes, but it can also actuate components, run system tests, program control modules. -Reading the trouble codes from your vehicle is easy, but without live data, bi-directional controls and other special functions, you may not have enough information to get the problem fixed right. -It allows you to use the scan tool temporarily activate or control ABS/Airbag system or component. -With NT630 Elite , the check of electronic components such as swithes, sensors, relays & actuators is made a simple task, saving your time and labor costs. -It gives you the ability to 'flash' ABS and Airbag control units with new program data and allows for the coding and programing of a replacement control module or changing previously stored incorrect coding as expensive factory tools do. for AU Ford ( For Australian Market Only ), for Acura, for Daewoo, for Honda, for Holden, for Hyundai, for Isuzu, for Infiniti, for Kia, for Lexus, for Mazda, for Mitsubishi, for Nissan, for Perodua, for Proton, for Scion, for Subaru, for Suzuki, for Toyota. For Audi, for Abarth, for Alfa-Romeo, for Aston Martin, for BMW, for Bugatti, for Bentley, for Citroen, for Dacia, for EU Ford, for Ferrari, for Fiat, for Jaguar, for Lamborghini, for Lancia, for Land Rover, for Maserati, for Mini, for Maybach, for Mercedes Benz, for Opel, for Peugeot, for Porsche, for Renault, for Rolls, for Saab, for Seat, for Skoda, for Smart, for Sprinter, for Vauxhall, for Volvo, for VW, for VWCV. For Audi, for Abarth, For Acura, for Alfa-Romeo, for BMW, for Bugatti, for Bentley, for Chrysler, for Citroen, for Dacia, for GM ( including brazilian car maker ), for Fiat, for Honda, for Holden, for Hyundai, for Infiniti, for Jaguar, for Kia, for Lamborghini, for Lancia, for Land Rover, for Lexus, for Maserati, for Mini, for Maybach, for Mercedes Benz, for Mitsubishi, for Nissan, for Opel, for Peugeot, for Renault, for Rolls, for Scion, for Seat, for Skoda, for Subaru, for Suzuki, for Toyota, for Vauxhall, for VW, for VWCV. The easy yet elegant design of this scanner was developed by technicians for technicians. Clearly arranged keypad, menu-driven operation, shortcuts and impressive 3.2" color display together make the scanner extremely easy to use. Foxwell NT630 Elite is built to last. It is constructed to resist impact and damage in the tough workshop environment. A rubberized sleeve protects your investment. The Secure fix, extra corner padding and screen protector ensure your scan tool will be around for a long time. Foxwell NT630 Elite ABS Airbag Scanner Free Upgrade Forever !!! With internet access, you will always have the latest bug fixes, new vehicles, newly added parameters and functionality at your fingertips. Simply install the SD Card into your computer or an SD Card reader, log into the PC application, and click update. The application does all the work,syncing the latest software to your tool.